Were you miss-sold a S.I.P.P.? Self Invested Personal Pension? Following the pensions freedoms in 2015 many people were offered considerable sums of money to leave their work pension, this was understandably an attractive option. Often they were advised to transfer into a S.I.P.P. after which they took some cash out to spend. They were specifically created to allow seasoned investors the opportunity to take more risks, and are not recommended for the general public. They allow for high management fees which is why financial advisors like to recommended them! We have seen cases where the fees are so high that the pension pot reduces substantially each year until only a fraction of it is left. When things go wrong there is no protection and you can potentially can lose everything. It’s your pension you do not want to invest in unregulated products. Pensions should be safe. S.I.P.P.’s allow high risk investments which are unsafe and not suitable for pensions for most people. High commissions are offered to financial advisers to recommend a SIPP. High commissions are available to financial advisors who recommend high risk investment products. High commissions are available to financial advisors who recommend unregulated investments. The incentive to sell you something which is unsuitable is obvious! Lack of understanding – you did not understand the process or investment that you were advised on? Hard sales or pressure selling – you felt uncomfortable or pressured into an investment that you didn’t really need or want? Given poor advice – you were advised to switch, even though your existing scheme was more suitable? Not clear about the fees – you were not made aware about the management fees? No advice given on risks – you were not made aware of the risky nature of the investments? Tax avoidance – did your advisor say a SIPP could be used for tax avoidance? 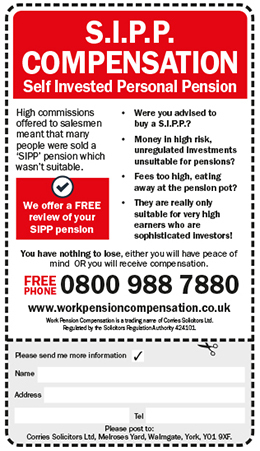 If any of the above applies to you it could mean you are eligible for SIPPs compensation. We offer a FREE review of your SIPP. We will advise you whether you have been miss-sold and are entitled to compensation. Or we will advise you that in our opinion there is not a claim. We can clearly identify a miss-selling case where you may not. The process is simple, to get things started all we need is the name of your SIPP provider and policy number. There is no cost to the review whatsoever. Our team include some of the uk’s leading pension experts. We are dedicated to helping people claim back the money that they could be owed from a mis-sold SIPP. When you decide you make your claim with us, we will contact SIPP provider on your behalf. We will then put forward your case, explaining clearly how you have been mis-sold. We only employ the best team members to fight in your corner, so when you make your claim with us, you can be sure you have the best chance of success. Please call us for a FREE REVIEW of your pension on 0800 988 7880. For a free review of your pension to advise you if you are entitled to compensation please contact us on: 0800 988 7997 or use the Free Review form on the right. Mr B from West Bromwich was advised to take out a SIPP after he was made redundant from a major engineering company for whom he had worked for over 30 years. He was able to transfer his final salary pension which had a transfer value of over £500,000. He was advised to put the money into a SIPP on the promise of wonderful returns. We carried out a review and found that the investments were unregulated, inappropriate and subject to high fees and difficult to access. We secured compensation of over £200,000. M J from Sheffield was advised to take out a SIPP after leaving a senior management position at a retail company. His transfer value was £800,000. He was advised to put the money into a SIPP which was invested in heavily unregulated investments and which promised huge returns but, were in fact highly speculative and risked losing everything. We carried out a review and successfully secured compensation of over £350,000.